Baixeries, J.; Balcazar, J. L.
In Database Theory, Multivalued Dependencies are the main tool to define the Fourth Normal Form and, as such, their inference problem has been deeply studied; two related notions appearing in that study are a syntactical analog in propositional logic and a restriction that maintains to this logic the same relationship as Functional Dependencies do to Horn logic. We present semantic, lattice-theoretic characterizations of such multivalued dependencies that hold in a given relation, as well as similar results for the related notions just mentioned. Our characterizations explain better some previously known facts by providing a unifying framework that is also consistent with the studies of Functional Dependencies. Baixeries, J.; Balcazar, J. 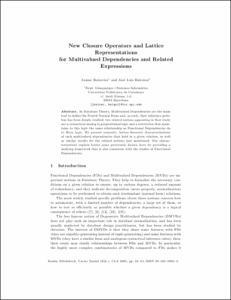 New Closure Operators and Lattice Representations for Multivalued Dependencies and Related Expressions. A: Concept Lattices and Their Applications. "CLA 2005 : proceedings of 3rd International Conference on Concept Lattices and Their Applications". Olomouc: 2005, p. 22-33.